As an integral part of the Carlin Springs Instructional program, we work with all grade levels to develop lessons that assist with their classroom teaching. 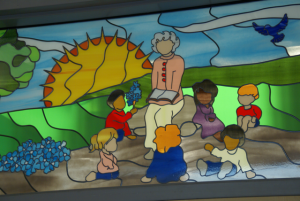 The Carlin Springs Library is a warm, inviting place where children feel safe to explore and learn. We promote independence by teaching students how to get information. Our goal is to help develop a love of reading in all of the children here! Our library is open Monday through Friday from 7:30 a.m. – 3:00 p.m.
Before school hours, students can check out books from 7:30 – 8:00 a.m.